I am writing about a Karna Pishachini Mantra after a long time because the interesting thing about this Mantra is that the Karna Pishachini does not actually whisper the future into the ears of the practitioner as is the case with most of these Mantras but enables the practitioner to dream about the future. There is no Siddhi Sadhana prescribed for this Karna Pishachini Mantra Prayog. However, if any of our readers has any reliable information about the same, they can share it in the comments section. The Karna Pishachini Mantra Prayog to see the Future has to be practiced at night, just before going to sleep by following the Vidhi or procedure described below. 1] The practitioner has to take a small portion of Kut / Koot or Kushta Ka Jad, which is called in the English language as the root of the Saussurea costus and an equal quantity of Haldi Powder and then grind it to a paste by adding a few drops of water. The root of the Koot Plant is extensively used in Ayurveda and Traditional Indian Medicine to treat a diverse range of diseases and ailments and also in many Tantrik and Paranormal Experiments of all kinds, including Vashikaran, Mohini and Akarshan Mantra Prayogas, some of which have been published on this site during the course of the past few years. The Koot Ka Jad can be easily found in most stores selling Ayurveda or Tantrik Products in India. The Haldi Powder that should be used for this Mantra Prayog must be pure and not adulterated. 2] Then, this paste has to be applied to the soles of the feet and the practitioner has to keep chanting the Karna Pishachini Mantra given below as he goes to sleep. As per the Tantra, the practitioner will see the future during the last Prahar of the night or approximately between 4 AM- 5 AM. Notes- All information given in this post is based upon authentic Tantrik Texts, however, this site cannot vouch for the sure-shot success of this Karna Pishachini Mantra Experiment to dream about the future. Extreme Caution should be exercised while practicing any Mantra Sadhana dedicated to Karna Pishachini because many Sadhaks, including some advanced Sadhaks have spoken about the harmful side-effects of these Sadhanas. Some other regular visitors and Sadhaks who know about or have experience about Karna Pishachini Sadhanas have also shared their personal experiences in the comments sections of various articles on the Karna Pishachini. Readers should go through their observations before proceeding with this Sadhana. 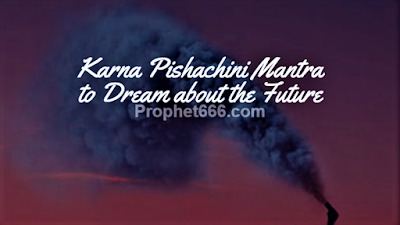 Many other Future Knowing Mantra Experiment dedicated to Karna Pishachini can be seen in the section on – Yakshini Sadhana and Mantras and Tantra for seeing the Past, Present and Future. मन्त्र सिद्ध हो जाने पर बेर के पेड के नीचे अपवित्रतापूर्वक लक्ष संख्या में जप करना चाहिए । इस क्रिया से संतुष्ट पिशाचिनी दूसरों की मन की बातें तथा भावी घटनाओं को कान में बतला देती है. इसका आशय स्वयं के मल मूत्र भक्षण से है ).